Yep, hammocks are great in the winter too! "Camping" is a word that invokes a certain scene in most people’s minds. A clear night sky above a wooded clearing. Marshmallows by the campfire. The chirping of crickets accented by the soft bubbling of a nearby creek and the occasional crack of the firewood. And a tent - watching over it all. For many people, camping means sleeping out in a tent and it’s hard to imagine one without the other. 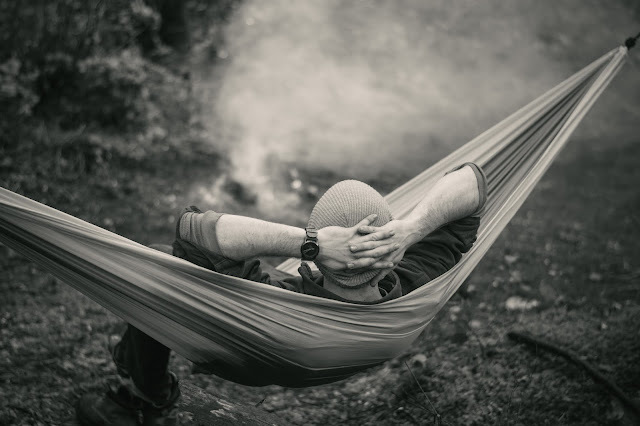 But Serac Hammocks co-founder Jeff Zhang loves spending nights out in his hammock. In fact, it's completely replaced his tent on all of his adventures. In today's guest post, Jeff busts some myths about hammock camping to help you decide if you want to ditch your tent on your next adventure. Myth #1: You can only hammock when it’s warm out. For many people, hammocking is reserved for the warm summer months, but a camping hammock is versatile enough to be used year-round. All you need to do is make sure you have the appropriate equipment for conditions you’ll be in. When hammock camping, the best way to stay warm is to use an under quilt plus top quilt combo. 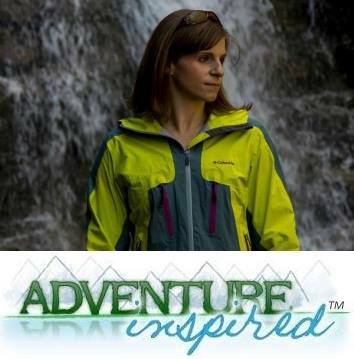 An under quilt is a down or synthetic loft blanket that goes on the outside of your hammock underneath you while a top quilt is basically a sleeping bag that doesn’t zip up. With this setup, you can stay toasty warm even in the dead of winter. You can also use your sleeping bag and sleeping pad in your hammock to insulate you. Some people find staying on top of the sleeping pad more difficult in a hammock than the flat ground of the tent, but others find it an ideal way to keep cozy and warm. There are also other ways to stay warm in your hammock. If you're thinking about camping in a hammock, being cold isn't a worry! Myth #2: Hammocks aren’t practical for camping. Unlike a tent, hammocks aren't enclosed and don't naturally protect from rain, wind and other bad weather. You're exposed to whatever nature decides to hurl at you. But when hammock camping, there are at ton of options available to you to provide as much shelter as a tent would offer. Rainflies exist in many shapes and sizes to keep the weather off your hammock. Most are simple to set up, and the degree of protection varies. For spring showers, a lighter tarp providing a basic roof might be enough. 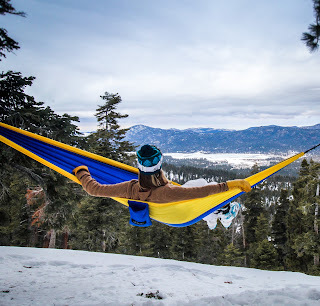 In heavy squalls or snowstorms, setups exist that completely enclose your hammock on all sides. This essentially creates a suspended tent with your hammock hanging inside. During the cloudless summer days, sleeping under the stars off the ground is absolutely divine. That can mean dealing with mosquitoes, but bug nets exist to protect you and your hammock from the flying little buggers. For hammock camping, investing in a mosquito net and a rainfly provides the same level of shelter that a tent does. And as an added bonus, hammock setups can be significantly lighter than tents. But what about being comfortable? Some people might assume that a night’s sleep in a hammock is bad for your back, and uncomfortable. But the proper way to lie in a hammock is at a diagonal, and the lack of pressure points can make sleeping in a hammock comfortable for most people. 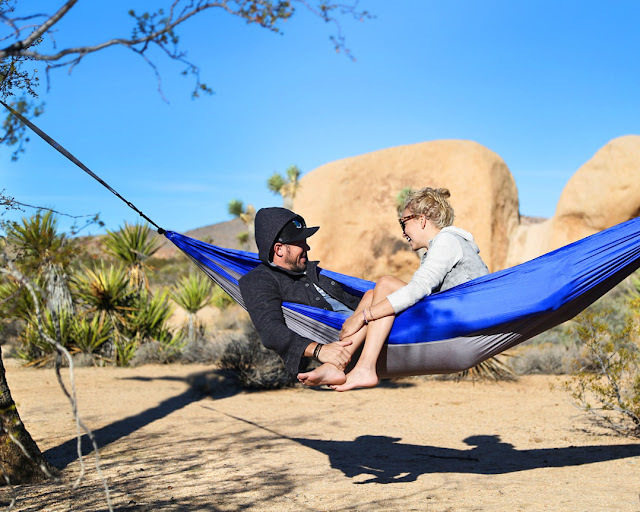 While sleep science is a relatively new field of study, there is some evidence that shows the positive health benefits of sleeping in a hammock. Myth #3: Hammocks can't hold a lot of weight. They're only for smaller people. I’m a big guy and I worried at first about whether a hammock could support my body weight along with my gear. I was nervous that the moment I got in my hammock, I’d tear through the bottom or uproot the trees in an embarrassing fashion. My fears dissipated quickly. Camping hammocks are made with strong nylon material and durable tree straps, making it possible for them to hold more than 350 pounds. As long you are using strong healthy trees, there’s no danger of your body weight tearing down the tree. As a rule of thumb, I look for trees with a trunk that I can’t completely wrap my hands around. However, all hammockers, just like tent campers should stay away from dead trees. The wood inside may be rotten and even a little extra weight might cause the tree to snap. Myth #4: You’ll flip over and fall out in the middle of the night. Imagine, you see a comfortable looking rope and spreader bar hammock in a friend's backyard. You go and sit in it carefully, noticing a slight wobble as you lower yourself slowly. You lift your feet, and as you lay down, you feel the hammock tilt. The next thing you know you’ve been dumped unceremoniously onto the ground. This isn’t an uncommon experience at all. Many people feel hesitant about hammock camping because they’re afraid that they might flip over in the middle of the night. Myth: busted. It’s very unlikely for a camping hammock to flip over. The reason backyard hammocks flip so easily is because of the wooden slats used to spread open the hammock. The spreader bar creates an unnatural center of gravity. It makes it easy to throw the entire hammock off balance with the slightest shift in weight. Most camping hammocks do not use any spreader bars, and the ones that do are designed in a way to eliminate this issue. When using a proper camping hammock, you won’t have to worry about flipping over at all...unless you want to. Myth #5: You have to be a knot master to hammock. I’ll be the first to admit that I’m pretty clueless when it comes to knots. My first concern when I decided to try hammock camping was that I’d have to learn a bunch of knots. I worried about trying to remember complicated patterns when I wanted to set up my chill spot. But the knot-master requirement isn't a requirement at all. With hammock straps, it doesn’t take a scoutmaster to hang your hammock. 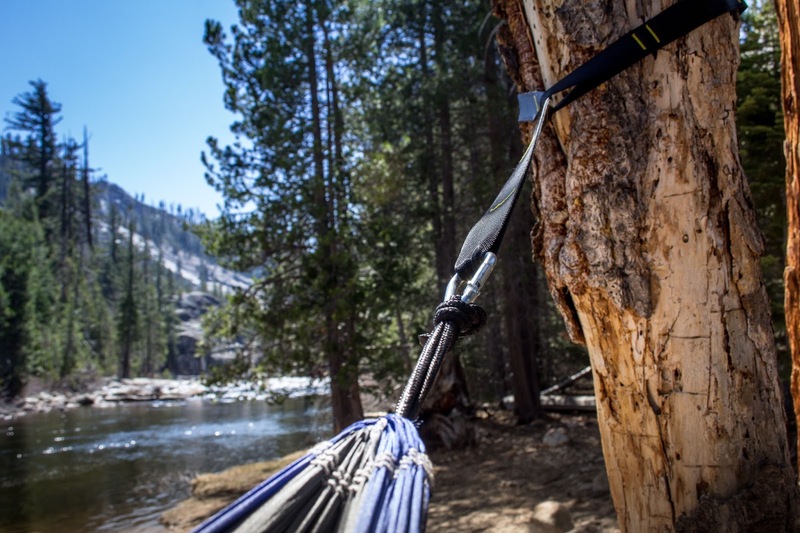 Hammock straps are often designed to easily wrap around a tree. They have multiple loops where you can clip in the carabiner attached to each end of your hammock. Not only do tree straps make setup easier, they are better for the tree than using bare rope. Rope cuts into the bark and can damage the tree, whereas the wide webbing of the straps spreads out the pressure exerted on the tree. Huge thanks to Jeff for offering his hammock camping expertise in this piece! I can't wait to give camping in my Serac Hammock a try when the weather gets warmer. If you’re curious about learning more, check out The Ultimate Beginner's Guide to Hammock Camping. If you're a hammock camping veteran, what tips do you have for beginners? And if you've never tried it, what questions do you have that we didn't answer here?